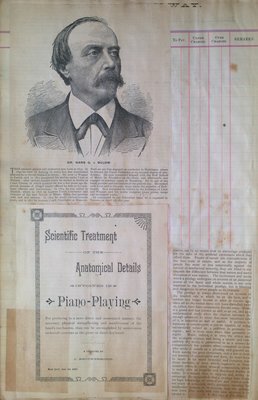 Page 17 of the first of Teresa Vanderburgh's musical scrapbooks - pamphlets and clippings of newspaper articles. Topics include an article about Dr. Hans G. v. Bulow as well as a pamphlet titled "The Scientific Treatment of the Anatomical Details involved in Piano-Playing. Also included is part of a newspaper article about prodigies. The article regarding Musical Prodigies is begun on Scrapbook #1 Page 19.